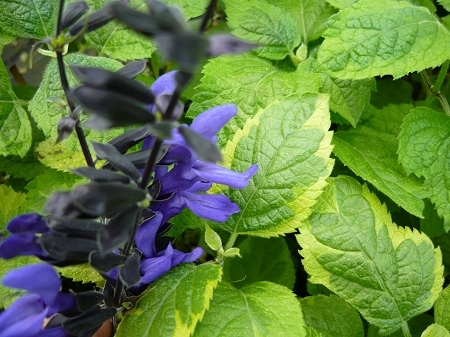 Omaha Gold Hummingbird Sage (salvia guaranitica 'Omaha gold')- Beautiful and unusual Hummingbird sage features large variegated green and gold leaves. Same outstanding blue flowers as black n' blue hummingbird sage that will attract hummingbirds from near and far. Tall upright grower. Perennial in zones 8-10. Live plant in 3 inch container.